The radar interferometer technique first used at the magnetic equator in Peru is also a very powerful means for studying auroral plasma instabilities. We present here the first results, obtained with a 49.92 MHz, 20-25 KW peak power pulsed radar located in Ithaca, NY (42.5° N, 76.4° W). Strong auroral echoes were obtained during several highly active periods. Phase differences between the signals received on the two antennas accurately determine the E-W position, within the scattering volume, of localized scattering centers, and changes in this phase determine the corresponding velocity. The signal Doppler shift describes radial (essentially N-S) motion. The data provide detailed information on the turbulent structure of the echoing region and show clearly that different features in the Doppler power spectrum often represent signals coming from different locations. If we assume that the radial and transverse phase velocities represent real drift velocities, we can determine full horizontal velocity vectors from the data and hence the horizontal electric field, usually with a time resolution of the order of 15-30s. 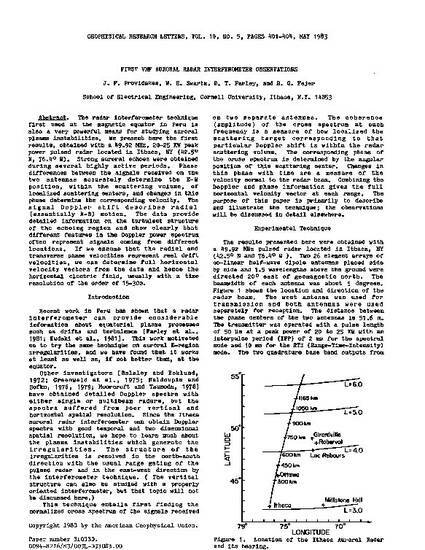 Providakes, J., W. E. Swartz, D. T. Farley, and B. G. Fejer, First VHF auroral radar interferometer observations, Geophys. Res. Letts., 10, 401, 1983.